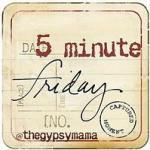 I’m joining The Gypsy Mama over at lisajobaker.com for Five Minute Friday today, where Lisa-Jo invites bloggers to “write for five minutes without worrying about getting it right.” That’s right. I had five minutes to write about a topic she pre-selects, today it was “risk,” without over thinking, spell checking, correcting, re-reading, all of that stuff. yikes. So, I had up one post and I followed all the rules as I wrote it but then I had another thought so I scrapped the first, set my timer and wrote the post below. Here’s my first attempt, which turned out to be more like ten minute Friday since I scrapped the first try. :0/ Mercy, Frans. :0) Check out the post and then hop over to the site and see how some of the other bloggers are pondering and writing about risk. We all knew that it was a healing service. And we had been told just the day before that we needed to “get our faith up” because if we wanted to see God do anything miraculous, it would require our faith, for His word does indeed say that without faith it is impossible to please God. As I sat in my seat, I could only imagine what were the needs of the people gathered there around me. I knew that I was coming searching for healing for the broken places in my mind and in my heart but what were the other needs? Was there a lame man who would dare to trust God to give his legs back their mobility, right there for all of us to see? Was there a blind man? A bleeding woman? What would we see that night? Who would dare take the risk to trust Him? And is there really any risk when you are dealing with the things of the divine? “Is there really any risk when you are dealing with the things of the divine?” – So true, and similar to my thoughts as well. Our Father in heaven is so trustworthy, faithful, and good all the time. The best choice we can ever make is to go for whatever He has for us! !